Two scheduled jump racing events will take place at Musselburgh and Plumpton, along with all-weather fixtures at Southwell and Kempton. 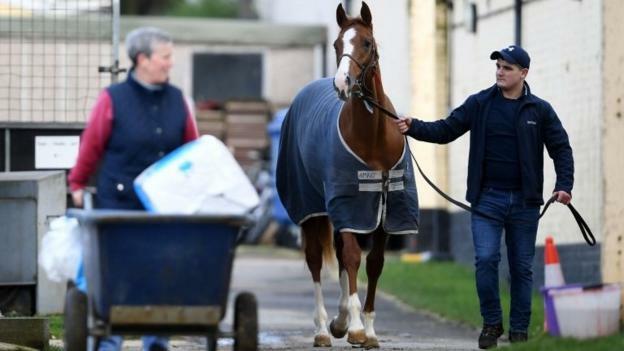 Racing was suspended after three cases of equine flu at Donald McCain's Cheshire stables. Three further cases were reported later at his yard. A total of 174 racing stables were placed in lockdown. Trainers will be assessed before they get all-clear to have runners, while five races called off during the shutdown have been rescheduled and Ascot will stage a nine-race card in Saturday. The Denman Chase, which was due to feature last year's Cheltenham Gold Cup winner Native River, and the Betfair Hurdle will be staged at Ascot after Newbury's meeting on 9 February was canceled. A decision to resume racing in a "controlled, risk-managed manner" was unanimously supported by an industry veterinary committee, said the British Horseracing Authority (BHA). The committee felt there was "unprecedented amount" of the highly infectious virus in Europe, and it was essential to take precautions to protect the horses. "Clearly there is some risk associated with returning to racing," said BHA's chief regulatory officer Brant Dunshea. "This risk has been assessed and, based on the evidence – and ensuring biosecurity measures are in place – the level of risk is viewed as acceptable." Fears there would be a prolonged suspension of racing, and a potential impact on the next month's Cheltenham Festival, were raised when a second outbreak, involving four vaccinated horses, was confirmed late on Sunday at trainer Simon Crisford's Newmarket yard. But no further positive results were found after thousands of samples were analyzed. While equine influenza is not unlike human flu – with typical symptoms including cough and high temperature – it limits the competitive ability of racehorses. Jump racing's showpiece Cheltenham Festival is scheduled to take place from 12 to 15 March. "Our approach since hearing about the first positive results last Wednesday was based on accumulating as much information as we could as quickly as possible so we could properly understand the risks of this virulent strain of grief spreading to more horses", said Dunshea. "It would be harmful to them and damaging to any trainers' yards that became infected. "It was also our intention to ensure that we avoid a problem that could result in long-term disruption of racing with the risk of many of our major events being overly affected". Extinction Rebellion: How could ministers win over the protesters?